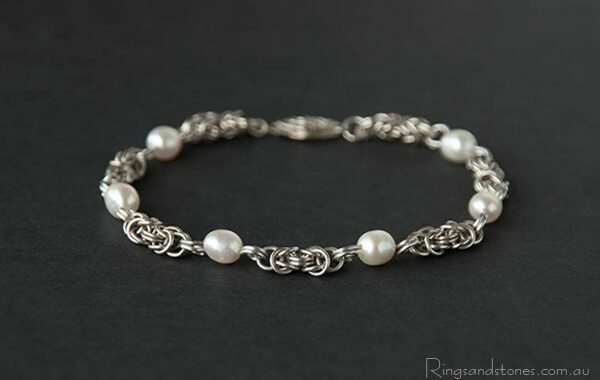 Sterling silver jewellery, stainless steel chainmaille, handcrafted artisan jewellery and accessories. Handcrafted original sterling silver jewellery for women and men. Artisan designed meticulously handcrafted, bespoke jewellery. Environmentally sustainable modern fashion accessories. 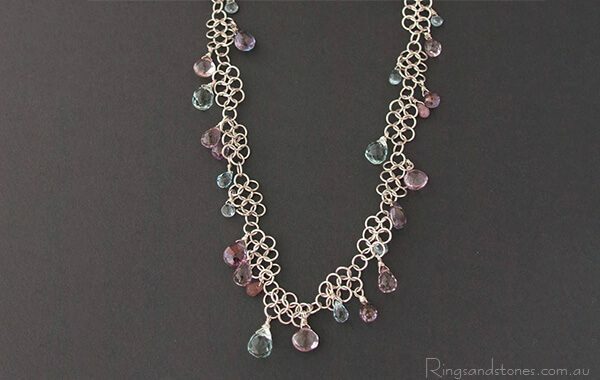 A fabulous mix of contemporary pieces from medieval Viking style chainmaille link chains to elegant unique gemstone necklaces, bracelets, and earrings. Men’s jewellery, bridal jewellery, Venetian glass jewellery and hand beaded original pieces. A beautiful online jewellery store filled with fabulous gifts, original ornaments, and custom-made jewellery to fit your personality. I use a range of materials from sterling silver to gold filled and stainless steel. Gemstone beads, Murano glass and Austrian and Czech crystals. If you see something that you would love in a different colour or stone, or maybe a different pattern, please contact me and I can research the options for you. All of my jewellery is handcrafted by me in my small artisan studio. Edgy modern armour giving you a connection to an ancient past. These delightful original earrings remind me of the art nouveau period, a time of dressy, ornate fashion and accessories. 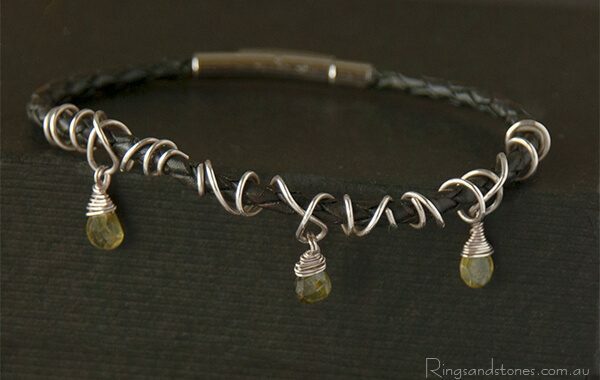 Chunky sleek man’s chainmaille necklace, meticulously handcrafted ring by ring. Sterling silver sapphire drop earrings. Original handcrafted gemstone jewellery made with beautiful materials. Stunning summer colours. Adorable handcrafted earrings. Modern chainmaille sterling silver bracelet handcrafted with traditional medieval chain making techniques. An earthy, woodland style, medieval bracelet. The ancient Viking culture was the inspiration behind this chainmaille bracelet. 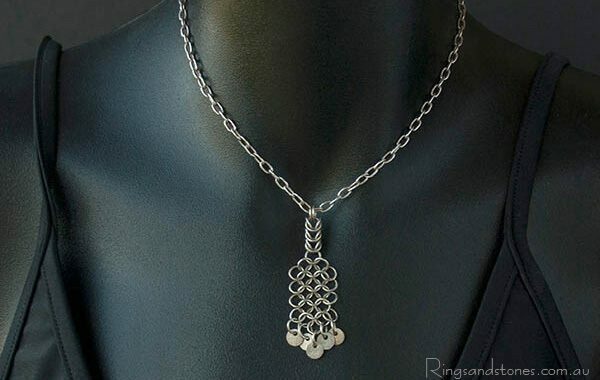 A strong looking chain with an interesting geometrical pattern. A detailed, original menswear accessory. Chunky handcrafted link bracelet minimal and understated. Blue brown gorgeous iolite gemstone beads radiate out of this original handcrafted bracelet. 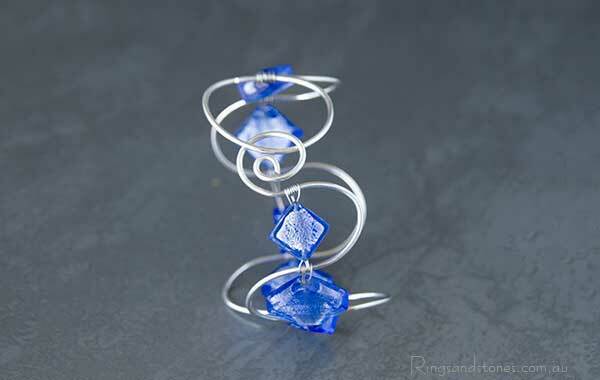 Stainless steel chainmaille, angular and jagged. This is a modern armour bracelet. Unique everyday accessory to show off your style customised with your birthstone or a stone that is special to you. Multi-coloured tourmaline gemstone earrings. Fashionable and colourful handcrafted silver earrings. Finely handcrafted, ring by ring, this bracelet has a gorgeous textural pattern and a solid comfortable feel. Contemporary love jewellery with dramatic silver and shiny black.